A series of architectural innovations, including a new advanced book building engine, results in NovaTick processing market data 300ns faster than before. NEW YORK, LONDON, PARIS- OCT. 18, 2016 – NovaSparks™, the leading field programmable gate array (FPGA) market data company, today announced it has completely redesigned its book building engine inside NovaTick, its latest generation ticker plant, dramatically lowering the processing latency for order based feeds. The new and improved book building engine is at the heart of NovaSparks’ pure FPGA architecture. One of the other architectural changes includes a new ultra-low latency PCS (Physical Coding Sublayer). This improvement is especially valuable to NovaLink customers, who use the FPGA-to-FPGA link to receive NovaSparks’ ticker plant data directly into their own FPGA trading systems. These architectural changes will be formally available for the Nasdaq TotalView ITCH feed in November, followed by all the other order based feeds currently supported by NovaTick in January. configured for the full universe of instruments. Output interface options of NovaTick, NovaSparks’ latest generation platform, and their resulting latency. NovaLink is the FPGA-to-FPGA link that enables trading firms to receive NovaSparks’ ticker plant data directly into their own FPGA trading systems. The data is consumed through a normalized hardware application program interface (API) provided by NovaSparks as an intellectual property (IP) core. By using NovaLink, trading firms off-load the feed handler functions of their overall design onto separate FPGA chips, which gives more space on their own FPGA to implement larger scale trading strategies that will not fit on a single chip system otherwise. NovaSparks will be exhibiting at the FIA Expo in Chicago on October 19 and 20, 2016. Visit NovaSparks at booth #713 in the blue hall. For more information about the new book building engine, NovaTick, or NovaLink, please contact sales@novasparks.com. NovaSparks is the leader in FPGA-based high performance and ultra-low latency market data solutions for the financial industry. NovaSparks unique FPGA centric approach delivers sub microsecond processing latency including book building, even during market peak periods. 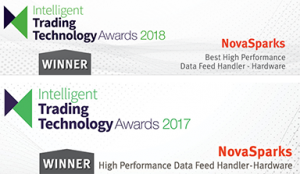 Available for over 50 feeds among the major Equity, Futures and Options venues across North America, Europe and Asia, the feed handlers are packaged in ‘easy-to-deploy’ appliances offering an extensive fan-out capability for market data distribution. Founded in 2008 and backed by well-established investors, NovaSparks’ offices are located in Paris, France and New York, USA.